There is a new item on display in the Zane Grey Cabin. It represents an era that many feel was responsible for bringing back the popularity of Grey’s books. 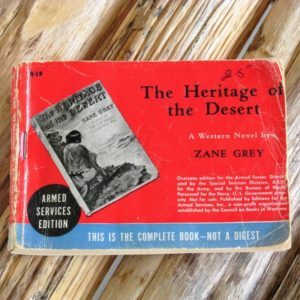 On a table that displays the books he wrote using the Rim Country as the setting, sits a small pocket-sized paper-covered copy of the Armed Services Editions of The Heritage of the Desert. When Armed Services Editions went to war. Grey’s Armed Services Editions were part of a concept initiated by a publicist and undertaken by several book publishers in conjunction with the Army and Navy in 1942. Before the project ended in 1947 approximately 1200 titles were selected and 120 million of the small pocket books were printed and distributed to troops stationed throughout the world. These books were shared and traded until they fell apart. Sometimes only pages remained to be shared. The project boosted morale and made readers out of non-readers. Many soldiers returned home to attend college on the GI Bill; something they previously had never thought of doing. When Books Went to War: The Stories That Helped the U.S. Win World War II by Molly Guptill Manning, tells the story of the Armed Services Editions. I had read Jennifer Maloney’s review of the book in the May 2015 issue of the “Zane Grey Review”. After reading Ms. Manning’s book I contacted her with my reaction. I explained to her how her book answered many of my questions about the world during my father’s military service in Europe. I shared that I was a docent at the Zane Grey Cabin and that my goal this past year was to locate one of Grey’s books published for that project. Ms. Manning responded quickly with a link to AbeBooks.com informing me there were two books currently listed. Now, in addition to The Heritage of the Desert located in the Cabin, Twin Sombreros is on display in the Zane Grey exhibit at the Rim Country Museum along with other of his publications. 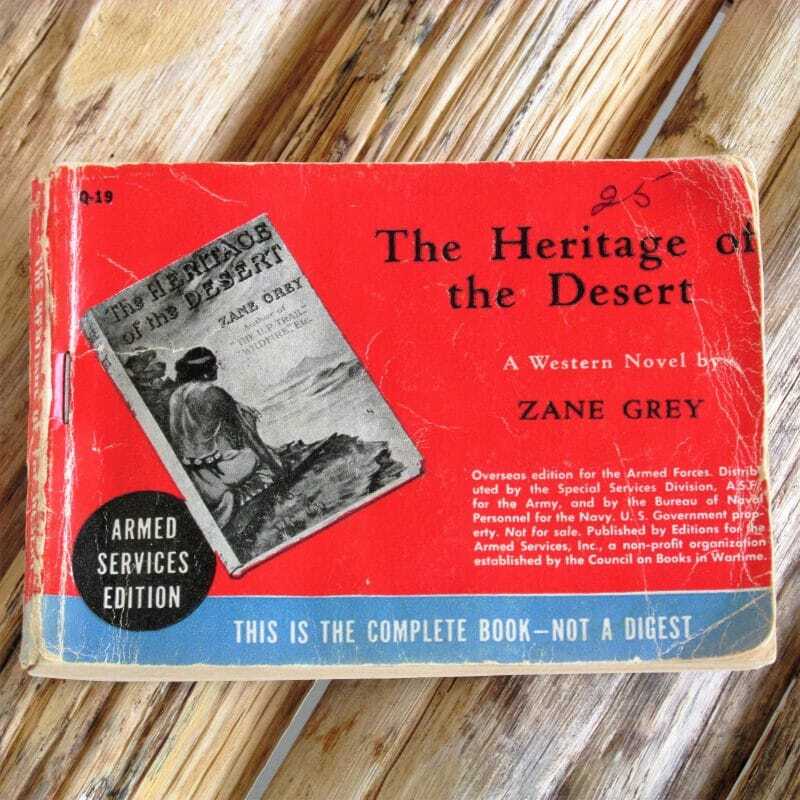 After sharing the story of Zane’s Armed Services Editions one visitor excitedly said to me, “That explains my father’s obsession with Zane Grey novels when he returned home after the war!” He went on to tell me that he was about 7 or 8 at the time and remembered the books piled up in their living room. He said his father’s friends visited to borrow or trade books and he described the endless hours his father spent reading them.